She’s worked for the big brands in the fragrance industry. 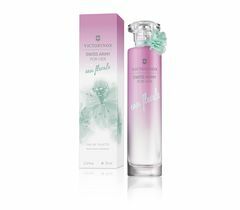 Learn about her process and her inspirations for Swiss Army For Her Eau Florale. At Victorinox, we not only care for our products. We are always curious about the people behind them. That’s why we wanted to talk to our perfumer, Nathalie Lorson. She is one of the world’s most sought-after fragrance creators and we are extremely proud she worked with us on For Her Eau Florale. Meet Nathalie and get to know her fascinating world of scents. The profession of a perfumer is similar to that of an actor, we need to take on and act out different roles to fit different contexts. Over the course of my 35 years in fragrance creation, I have had the opportunity to immerse myself in a multitude of diverse styles, artistic inspirations and brand universes. The magic of my craft lies in the creation of emotions and the exceptional encounters with charismatic brands that nourish my passion. The chance to work with each individual creation house is a precious gift. And as an artist, my inspiration often comes from our shared creative experiences. What is the most challenging aspectin your work? The most challenging aspect of being a perfumer is the creation and transformation of emotions into addictions. They only come when we are able to capture the perfect fit between the fragrance and the person who wears it. How do you proceed when you create a new fragrance? Discussions with inspiring people are critical, they bring to life the ideas behind the scent. My inspiration comes from everything around me: new raw materials, a surprising combination of new scents, a color, and most importantly, the brand universe, which typically will influence the final shape of the fragrance. Always behind the scenes, I translate the brand history into an olfactory tale. What makes a good fragrance in your opinion? Elegance in fragrance is conveyed through beautiful raw materials. The selection of these precious ingredients is intimately linked to the image and refinement I want to express in my creations. The curation process could be compared to the choice of stainless steel for the master cutlers who transmit the Swiss excellence in heritage. It involves texture, color, light, and all other qualitative aspects that will define the final composition. My perfumer’s palette is made of best-in-class ingredients, both naturals and synthetics, and my intuition guides me to find the perfect fit with the most sophisticated image of the brand. What inspires you when creating fragrances? I am a very visual person. Colors and shapes guide my creativity. My work is the instinctive expression of my visual emotions. The morning dew on flower fields evoke for me the sparkle of silver metal. Absolutely stunning with its unique radiance, a floral bouquet starring peonies inspired Eau Florale, the sparkling and joyful scents unveiled a cocktail of colorful and juicy facets that remind me of a walk around the middle of a flower field. Can you tell us a bit about the inspiration behind the new fragrance Swiss Army For Her Eau Florale? The positive emotions from the project were the best motivation. It was all about freedom, happiness, nature, fresh air and space. This floral and fresh fragrance produces the relaxing sensation of a precious and carefree moment. The idea was to capture the experiences of joy and happiness wrapped in comfortable musks for a unique signature. Is there a Nathalie Lorson “style”? Everybody has his or her own style, it’s like writing... Personally, I like to work with many different types of ingredients and explore them beyond their limits. I like the dynamism of switching from one project to another, and juggling different ideas. I like to explore and discover. Is there a particular scent or aroma you dream of capturing in a fragrance? I dream of catching the atmosphere of mountain peaks and recreating the scent of clouds. I would translate this breathtaking effect to convey the amazing feeling of fresh mountain air on the skin. I often wear the fragrance I’m working on at the moment. When I’m on a break, I like the velvet veil of musks, they provide a soft comfort, a delicate wrap. Of all your creations, which one is your personal favorite? Among my creations, my favorites are those that left me with a strong memory. But like a mother who loves all her children I wouldn’t choose only one of them. Nathalie was born and raised in France. Her father was a chemist at a fragrance manufacturer – so early on, she was introduced to the fascinating world of scents. Since there is no university to attend when becoming a perfumer, she was trained by her father’s company. In 1987 she graduated and has since then created some of the world’s most iconic scents.